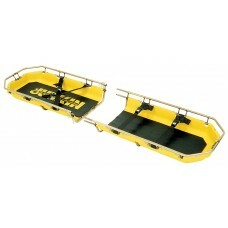 The same construction as JSA-200 except it is a break-apart stretcher. ✔ The Junkin JSA-200-B breakaway stretcher breaks into two halves which can be back-packed to the point of rescue and assembled in seconds. ✔ Positive-locking quick-release pins secure two halves together. ✔ Four straps are standard.